The Ultra RangePlus Wireless-N PCI Adapter with Dual-Band adds wireless connectivity to your desktop computer. Install it into an available slot in your computer, and enjoy great high-speed wireless network access without running wires. 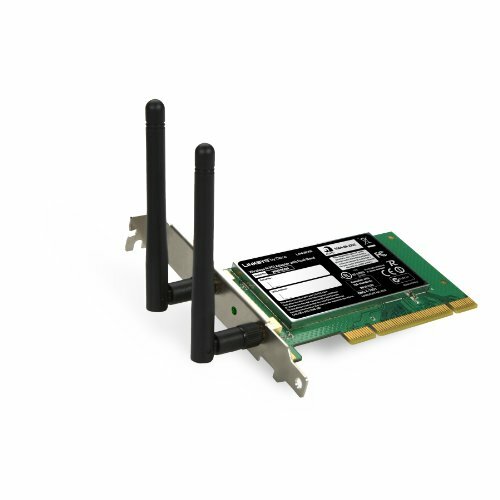 The Wireless-N PCI Adapter uses the very latest wireless networking technology, Wireless-N (draft 802.11n). By overlaying the signals of multiple radios for each band, Wireless-N's "Multiple In, Multiple Out" (MIMO) technology is designed to multiply the effective data rate. Unlike ordinary wireless networking technologies that are confused by signal reflections, MIMO actually uses these reflections to increase the range and reduce "dead spots" in the wireless coverage area. The robust signal travels farther, maintaining wireless connections much farther than standard Wireless-G.